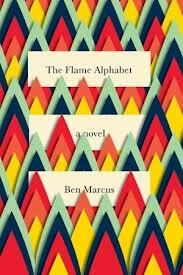 The premise of The Flame Alphabet by Ben Marcus doesn't make it sound like it's going to force you to do brain yoga. Language of children has become toxic and is slowly killing the adults. Cool, dystopian vibe, right!?! I picked this book up thinking it would be the last of my fun summer reads, another serving of Pop Rocks with a poolside helping of Diet Coke. Something to be read while licking orange cheeto dust off my fingers. By the time I hit page 50 I realized I had underestimated it. Things were happening in the book that seemed well outside of the premise I'd been sold. Forest Jews were receiving religious instruction through listening devices connected to orange wires and somehow this was ground zero of the language toxicity epidemic. My complete lack of knowledge on the subjects of Jewish mysticism and Kabbalah became evident, which brought on a full scale Jewish-style guilt trip because this seems like information a good non-Jewish mommy would investigate for the benefit of her half-Jewish kids who, according to Orthodox principles, aren't technically Jewish. I got over my guilt and soldiered through the chapters of pseudo-science which explained the roots of langauge toxicity, how it came into being and how it took hold. I wish I could explain it here, but I won't. For one thing, I'd hate to spoil it for you. For another thing, I'm really hoping someone else will take it upon themselves to read this book and explain it to me. You can see why, after these chapters, I decided I needed some guidance. On Goodreads people either hated or loved this book. The positive reviews didn't just love it, they were passionate about it and used words like genius, masterpiece, ground-breaking. The negative reviews claimed it was boring and couldn't see what the fuss was about. The negative reviews made a compelling argument to keep reading. I became determined I WOULD see what the fuss was about and so I pushed on. Instead of poolside with Cheetos, I read it in the evening when it was quiet, before bed. Halfway through the book I began to have Flame Alphabet nightmares, dreams where I searched for ways to speak to my children without reliance on words (written or spoken), gesture or facial expression. The main character's search for alternative alphabets made me think about creating my own with equal lack of success. I realized the book was easier to read and more comprehensible in small doses and so that's what I did; just one or two chapters a night. Even so, reaching the end just made me feel like I needed to go back and start at the beginning. Maybe if I did that I'd understand it better. Maybe the first reading was like the primer and the second reading would make everything clear. Or maybe the fuss is because this is a book with the capacity to engage both subconscious and imagination. Given the odd nature of this book review, I'll understand if you don't feel compelled to rush out and buy it. But if you do, please let me know. I'm suffering from my own case of The Flame Alphabet induced language toxicity, in that I'm dying to talk about it with someone. Labels: My apologies to Ben Marcus for featuring his book with a bag of Cheetos. But really, wouldn't it be amazing to write a book with that kind of addictive quality. 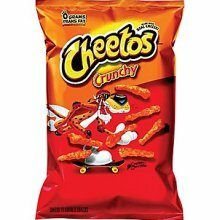 Cheetos. Books. Yum. This book sounds really cool. 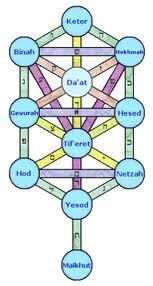 I have always been fascinated by the Kabbalah ever since I learned about it in a mysticism class in college. Tarot is rooted in Kabbbalah, as well, and I'm totally into that, too. Thanks for letting me know this book exists. The premise sounds like genius to me, so I'll have to check it out. I think your tags are as compelling as the post! The book sounds interesting! This is the first I've heard of it. My brain has been shying away from esoteric reading in favor of pure entertainment. Kudos to you for finishing it. Well, I was going to read it based on that first paragraph. Now...I'm just not so sure. I don't think a book should give you nightmares; that'd be scary. I also think it's easier to enjoy books that are easier to understand, because reading books is supposed to be fun. Sounds like a mind boggling book! If I ever get through my stack of books, I may take a look at this one. 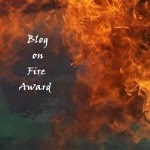 But holy smokes, it must've done something to you cuz this blog post is deliciously written. Not that they aren't usually, but this one just has a magic to it. Shell, please let me know if you read it. Would love to hear your take. Connie, I've been having fun with tags lately. Katie, that's always how I feel when I read reviews like this. Josh, soldier through. You can do it (and no that's no self-interest you hear in my response). Emily, totally understand that it can be a mood based thing. Neurotic, I'm not sure I agree. That it reached into my subconscious makes me feel like it was powerful writing...whether or not I understood all the nuance. How interesting. Both the book and that you soldiered through. I think when added together, both of those things say something deep about the book and about you. I think my head is messed up enough! Sounds like the kind of book you want to read with a class so every few chapters the professor can give you the history and background you need to really grasp it. A bookclub might work... and wine would probably help. I am with Katie, though, that a review like this makes me more intrigued than a lot of gushing ones do. I have never heard of this book. It does sound fascinating. Thanks for highlighting it today! Wow - sounds fascinating - and intense. The concept of language toxicity is fascinating! What an interesting concept. I have to put this book on TBR. I already know my brain is too mushy for this right now. But it sounds like something my husband would love. Maybe I'll have him read it and explain it to me. Whether the book is worth the read or not, your post is absolutely hilarious! And I agree, a book as addicting as cheetos is the best! This post was all serious like, and then I read your label. ROFL! Best "label" ever. I haven't even heard of this book before now and your review has certainly made me curious! I hate that feeling when you really want to talk about a certain book but either no one's read/reading it or they aren't far enough long so you can't chat about it. Argh! I love books that make me think :) I know nothing about the Kabbalah or Jewish mysticism, but I might take a crack at it anyway. If so...we can talk! Interesting, Johanna... Thanks for this honest post... Makes it even more intriguing! I am actually really tempted to rush out and get this book, for curiosity's sake! I love things that are different, and you make this seems very different. Absolutely love the labels! I felt confused just reading the premise of the book so I doubt I'd make it through LOL. I had to laugh about your Jewish style guilt trip. Since I grew up Catholic, I understand those trips all too well LOL.